What Does 2017 Hold for 3D Printing Stocks? 3D printing stocks have some momentum as we head into 2017. Here are some predictions for the coming year. Before investing in stocks, here's some advice to help beginners choose the right one. Even Nostradamus would likely have trouble predicting with accuracy what 2017 holds for 3D printing stocks, including the two largest players, 3D Systems (NYSE:DDD) and Stratasys (NASDAQ:SSYS). It's very difficult to predict how any company's stock will perform over the relatively short term because there are often disconnects between how a company's business is performing and how its stock is performing. Long-term investors should focus on how well their company's business is doing, as the stock's performance will take care of itself eventually if the underlying business is moving in the right direction. That said, we're going to look at some possible happenings in the 3D printing industry in 2017 that have the potential to affect companies' financial performances, and hence, their stock-price performances. 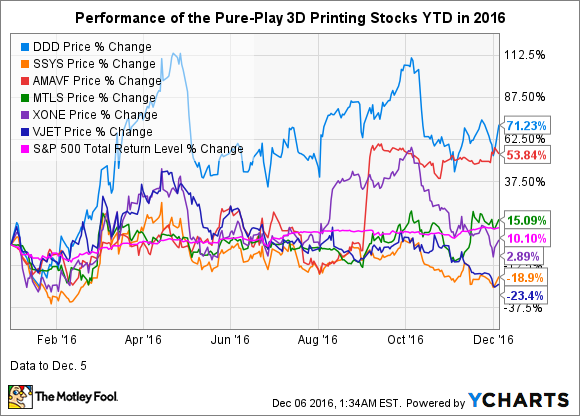 But first, here's a look at how the pure-play 3D printing stocks have performed in 2016, through Dec. 5. Data by YCharts. DDD = 3D Systems, SSYS = Stratasys, AMAVF = Arcam, MTLS = Materialise, XONE = ExOne, VJET = voxeljet. While 2016 isn't over yet, it's looking like it will mark the first year since 2013 that any of the pure-play 3D printing companies except Arcam -- which gained nearly 19% last year -- have had an up year. So, there's some stock momentum as we head into 2017. Here are some predictions for the coming year that could affect these stocks. 1. Macroeconomic headwinds will likely continue. It seems more likely than not to me that the widespread slowdown in demand for enterprise 3D printers that 3D Systems and Stratasys have encountered since early 2015 will continue in 2017. However, I don't think things will get worse from an overall industry demand standpoint -- as long as the economy holds up. Stratasys' management has attributed this major slowdown to overcapacity in the field due to the large number of 3D printers that were purchased during the previous few years. It has also opined that another factor is that sales cycles have lengthened because of the increased number of product choices. I continue to believe that a third factor is that some customers had been delaying purchases to see what compelling new offerings might soon come to market. This last factor is likely to somewhat abate as we make our way through 2017 because the two companies whose planned entrances into the market were widely anticipated -- HP Inc. (NYSE:HPQ) and start-up Carbon -- both launched their flagship 3D printers this year. 2. Strength of leadership should become more clear at 3D Systems and Stratasys. In investing, it's usually wise to bet on the jockey -- the CEO -- while also giving some weight to his or her top team, particularly the CFO, and the company's board of directors. However, the betting-on-the-jockey strategy was upended for much of 2016 with respect to the two largest publicly traded players. 3D Systems' entire C-suite was shaken up in 2016, while Stratasys got a new CEO. 3D Systems CEO Vyomesh Joshi -- a longtime top 2D printing exec at Hewlett-Packard before it split into two companies -- came on board in April, while Stratasys CEO Ilan Levin -- a longtime board member -- took the helm in July. So, investors have had only a couple of quarterly conference calls in which to get acquainted with these new leaders. Joshi brought on board John McMullen as CFO in July, after having parted ways with the former COO and CMO in June, neither of whom has been replaced. McMullen, who previously held the top financial spot at Eastman Kodak, worked with Joshi at the former Hewlett-Packard. 3. HP should reveal some 3D printer sales data. In May, HP Inc. launched two 3D printers powered by its proprietary Multi Jet Fusion technology. The more powerful Jet Fusion 4200 was scheduled to begin shipping in the fall, while the 3200 will be available in 2017. At launch, the company renowned for its 2D-printing tech named several top-tier partners, including Nike and BMW. HP claims that its 3D printers, which print in polymers, are up to 10 times as fast and twice as cost-efficient as 3D printers powered by the leading technologies. Given these and other features, HP's goal -- like Carbon's -- is to make deeper inroads into the manufacturing sector than 3D printing has thus far been able to do. As a publicly traded company that's been touting 3D printing as one of its largest growth opportunities, HP should reveal 3D printer sales data at some point relatively soon. Investors shouldn't expect to hear much or even any data early on, as companies often like to nurture their new ventures for a while without the critical glare that can result from providing financial stats. That's a reasonable stance for a while, but if we reach the end of 2017 and HP hasn't shared any data on 3D printer sales, I'd take that to mean they likely aren't going that well. 4. Carbon might reveal additional 3D printer subscription stats. In April, venture capital-backed Carbon launched its M1 3D printer powered by its speedy Continuous Liquid Interface Production (CLIP) 3D printing technology. The M1, which prints in polymers, was immediately available via a three-year subscription -- a unique distribution model in the industry. Carbon co-founder and CEO Joseph DeSimone's demo of CLIP at the TED 2015 conference surely lent weight to Carbon's claim that CLIP is 25 to 100 times faster than the leading 3D printing technologies. Moreover, Carbon touts CLIP as possessing immense materials possibilities and as being capable of producing polymer parts with mechanical properties and surface finishes on par with injection-molded ones. Carbon is privately held, so it's not required to release any sales data. That said, it seems likely that it will periodically disclose how many 3D printer subscriptions it has sold, because it's already done so. By mid-September, Carbon had leased out 50 of its machines and expected to have 100 operating in the field by the end of the year, and at least 500 within the next year, according to TechCrunch. Carbon is shaping up to be a formidable player in the industry. It's raised $222 million in venture capital, with backers including Google Ventures and GE Ventures, the VC arms of Alphabet and General Electric (NYSE:GE), respectively. Carbon is partnering with Ford, while former Ford CEO Alan Mulally is on its board, as is former DuPont CEO Ellen Kullman. 5. There will potentially be more M&A activity. On the heels of General Electric's recent aggressive move into the metal 3D printing space, we could see some more merger and acquisition activity in the 3D printing industry in the future. In September, the industrial titan announced plans to acquire two metal 3D printing companies, Sweden-based Arcam and Germany's SLM Solutions, for a total of $1.4 billion. After the takeover of SLM fell through, GE acquired a controlling stake in another German maker of metal 3D printers, Concept Laser, with a right to purchase the entire company within a few years. The combined approximately $1.3 billion deal -- the largest ever in the 3D printing industry -- is part of GE's plan to generate $1 billion in 3D printing revenue by 2020.